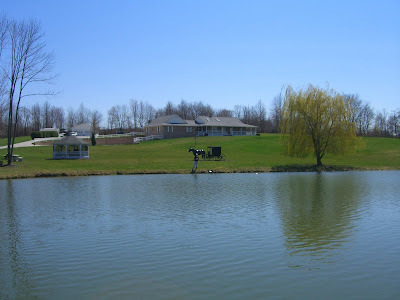 My grandparents have the perfect Ohio home, set on a spacious property with a lovely little lake in the front yard. When they dug the lake years back, they stocked it with all kinds of fishies big and small. The catfish they threw in multiplied to the point where my dad claims that at the height of summer, he can throw a fishing line with little or no bait into the middle of the lake and seconds later, without fail, 10 times out of 10, a monster catfish is tugging and fighting on his line. 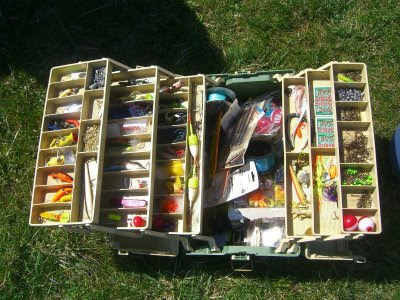 Now, I have no doubt that my daddy is an incredible fisherman, as you can see for yourself from the multitude of hooks and lines and sinkers in his tacklebox. And, yes, he undoubtedly has a knack for finding that one watery spot where the local fish kingdom likes to congregate. 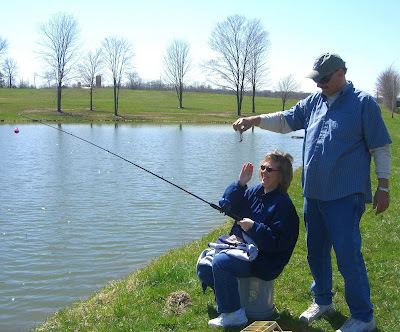 But unfortunately, the day he took me fishing for catfish in my grandparents’ lake, the fish had decided to take a nap instead of swimming around, daring each other to eat worm segments wrapped around razor-sharp metal objects. 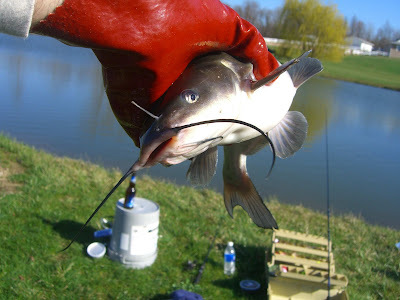 But the pesky catfish continued to elude us. Bored with the wait, and increasingly skeptical of a fried catfish dinner, Dad thought he could entice Mom to try the worms and see if we couldn’t fry them up instead and pair them with hushpuppies and slaw. She didn’t like that idea, so ma and I headed to the house to replenish our beer stash and help my grandma pull together the batter for the hushpuppies. Well OF COURSE as soon as we left the lake my daddy caught the first catfish of the day! We had planned to slaughter and fry up any catfish we caught, but we just didn’t have the heart to murder this one lone guy. 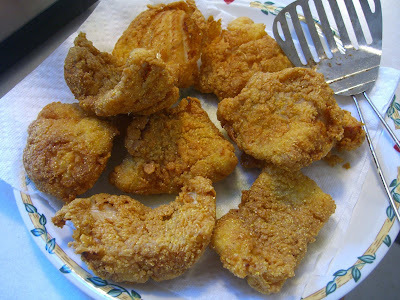 Ma picked up some catfish on sale at the local market, instead, and we marinated it in buttermilk and fried it in a cornmeal batter based on a recipe from Jean Anderson’s A Love Affair with Southern Cooking. I just don’t think you can have fried catfish without hushpuppies. My hushpuppy recipe creates light and airy, slightly sweet fritters speckled with green onions. 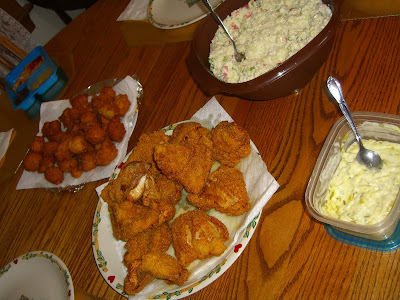 With mom’s tartar sauce and grandma’s coleslaw, dinner that night truly was a family affair. Using a deep fryer or deep, heavy pot, preheat peanut oil to 375 degrees F. In a large mixing bowl, stir together the cornmeal, baking soda, sugar, and salt. Stir in the grated onion and green onion. In a separate bowl, stir together the buttermilk and beaten egg. Pour these wet ingredients into the dry ingredients and mix until blended. Drop the batter by rounded teaspoonfuls into the oil. 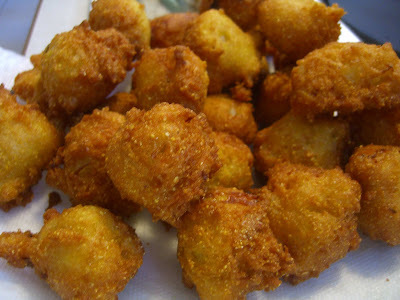 (If hushpuppy batter sticks to spoon, dip the spoon in a glass of warm water after each hushpuppy is dropped in the oil). 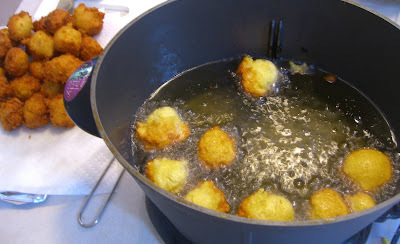 Fry, no more than 6 or 8 at a time, until golden brown, maintaining oil temperature at 375 degrees and turning the hushpuppies during the cooking process. Each batch should take two or three minutes. Drain on paper towels or on a rack and serve immediately. I must try out your recipe but can I replace the cornmeal with other like normal wheat flour? Hi pixen! Do you have access to polenta? It's very similar to American cornmeal and I'm sure would work well in this recipe... thanks for stopping by and let me know how it turns out if you decide to make hushpuppies! yum. Thanks Rebecca! Yep, my grandparents really do have it made. Gosh I saw Weetabix on your blog - wow - I didn't know you could get them in the States - I'll keep my eye out! It was my breakfast of choice when I was living in Australia. Hi I couldn’t find an email address to send this to, but I’m an Account Manager from G2, a marketing firm, and we’re putting together a cooking contest called the Aetna Healthy Food Fight, and it’s making its way around the country. It’s coming to Jacksonville on October 15-16. I found your blog and it caught my attention. You, or your followers, could get great exposure for recipes and meet celebrity cooks (Bobby Flay, Sunny Anderson, Sara Moulton, or Cat Cora). Please go to healthyfoodfight.com to check it out. Deadline to sign up for Jacksonville is September 29. Good luck if you decide to enter! Simple but admirable content. Wonderful posts! Great stuff, just great!